These instructions are the essence of the nectar. (Serlingpa or Dharmakīrtiśrī – the Teacher of Atiśa in Sumatra). They are like a diamond, the sun, and a medicinal tree. Understand the purpose and so forth of these texts. transform them into the path to Enlightenment. Ponder that phenomena are like a dream. Discern the basic nature of awareness that has no arising. The opponent itself liberates itself in its own place. The essential nature of the path is to settle within a state of the all-encompassing basis. Between sessions, act like an illusory person. Train in both giving and taking in alternation, mounting those two on the breath. - (while) training with words in all paths of behaviour. As for the order of taking - start from myself. and meditating with great kindness toward everyone. (4) requesting the Enlightening influence of the Dharma protectors]. (So) instantly apply to meditation whatever I might happen to meet. while giving importance to my path of deportment. - then I’ve become trained. [1. Don’t contradict what I’ve promised. 2. Don’t get into outrageous behaviour. 3. Don’t fall to partiality]. (4) Transform my intentions, but remain normal. (5) Don’t speak of (others’) deficient or deteriorated sides. (6) Don’t think anything about others’ (faults). (7) Cleanse myself first of whichever disturbing emotion is my greatest. (8) Rid myself of hopes for fruits. (9) Give up poisoned food. (10) Don’t rely (on my disturbing thoughts) as my excellent mainstay. (11) Don’t fly off into bad play. (12) Don’t lie in ambush. (13) Don’t put (someone) down about a sensitive point. (14) Don’t shift the load of a dzo to an ox. (15) Don’t make a race. (16) Don’t reverse the amulet. (17) Don’t make a god fall to a demon. (18) Don’t seek suffering (for others) as an adjunct for (my) happiness. (1) Do all Yogas with One. (2) Do all the quashing of what’s distorted with one. (3) At the beginning and the end, have the 2 actions. (5) Safeguard the 2 at the cost of my life. and specifically, these practices and points to train in]. (6) Train in the 3 difficult things. 3. being mindful to maintain them]. 3. gaining the favourable circumstances]. 3. stability in maintaining these practices and trainings]. (9) Possess the 3 inseparables. - being inseparable from helping others]. (10) Act purely, without partiality to objects. (11) Cherish (applying) wide and deep training toward everything. (12) Always meditate toward those set aside (as close). (13) Don’t be dependent on other conditions. (15) Don’t have reversed understandings. (18) Free myself through both investigation and scrutiny. (19) Don’t meditate with a sense of a loss. (20) Don’t restrict myself with hypersensitivity. (21) Don’t act for merely a short while. (22) Don’t wish for (any) thanks. 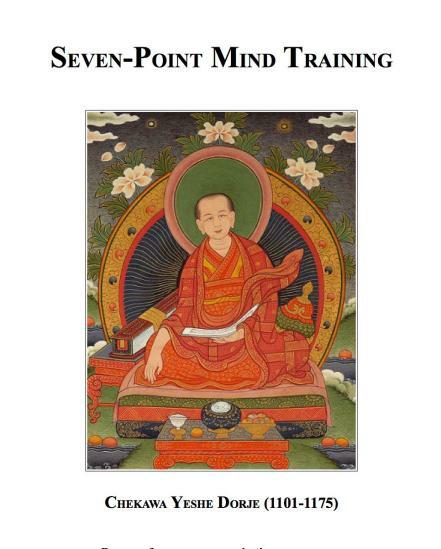 This essence of nectar of quintessence teachings is in lineage from Serlingpa. my admiration (for this practice) abounded. I requested the guideline instructions to tame my self-grasping. Now even if I die, I have no regrets.